After his brother is convicted of murder, Shane Mason will do anything to clear his name. But when his investigations lead him to enter South Dakota’s Desert Quest extreme race, Shane is floored by the surprise waiting for him. Kelly Cloudman—the woman he can’t let himself love—is the race’s medic…and the killer’s next target. A painful memory from his past divided Shane from Kelly, but he’s not going to let her out of his sight again. Even if it means revealing his secrets, Shane won’t stop until he’s found the truth—and kept the murderer from striking again. 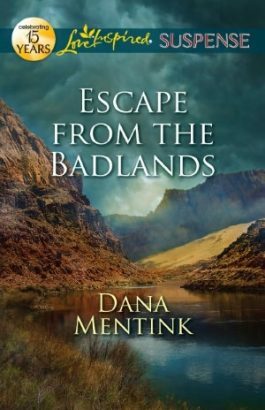 ESECAPE FROM THE BADLANDS was my first read by author, DANA MENTINK. The first fifty pages had me turning them quickly. I couldn’t wait to see what was going to happen next. Shane Mason’s rescue of Kelly Cloudman, had me sitting on the edge of my seat. Kelly Cloudman needed a job, so when she’s asked to be a medic for South Dakota’s Desert Quest extreme race, she says yes. When her vehicle is trapped and threatens to be overtaken by water, she never would have guessed in a million years who her rescuer would be. Shane Mason is on a mission. A mission to prove his brothers innocents before it’s too late, and enters the race of his life. The last thing he expected was to come face to face with the woman he walked out on.